“The idea of running with the Kenyans in Kenya became a dream of mine 2 years into my amateur running career. Having followed the careers of many talented Kenyan runners, I set my goals in one day getting to run in their hometowns. When the opportunity to run the Safaricom marathon came about I planned for a whole year to make it happen. I tried to recruit others to come with me but I was determined to go alone if need be. I would train and do whatever it took to get there. The one thing that was most important to me during this venture was that I’d run representing my club Lez Run and the LGBTQ community. I knew the possible dangers that were ahead of me in doing so, after all being gay in many parts of Africa is a crime. The reality of what was to come started hitting me the day before the race. I frantically searched for the internet connection that would put me in touch with my loved ones back home. I needed to hear encouragement from them that things would be okay. I jokingly told them that they could have my running gear should I be arrested for being openly gay via my club shirt. I had struggled to focus on the conversations happening around me throughout the day. I became so anxious that my stomach could not hold anything and I got diarrhea (a runners worst nightmare). At the race briefing I pulled the race coordinator aside and asked her if there would be a problem with the club shirt I planned on wearing on race day. I told her I was representing a lesbian running club. The concerned look on her face said it all. But she did her best to assure me that no one would make the connection of Lez Run as a lesbian running club. However, her concerned look had me blurt out “”I would not disclose that I’m a lesbian if asked”” I instantly felt ashamed of what I was saying. She called on to another race coordinator and clued him in on the situation. He was quick to respond “”Being gay is illegal in Kenya!”” I repeated the same shameful statement to him as I did to the other race coordinator, now thinking I could jeopardize others through “”gay by association””. But I couldn’t help myself and told him that wearing the shirt and representing my community was important to me. Hell, others would be out there representing their clubs! Why not me!?! I thought. “”You know what? Wear it!”” He replied with a smile. We stood there looking at each other for a brief moment not sure what we were all expecting, but I felt relief. When I got back to my room I laid out my club shirt and vowed to be honest with myself no matter what the consequences were come race day. I apologized to it for having blurted out that statement earlier. This shirt represented so much of me and I would wear it proudly. No matter what. Race day came quick and I barely slept. But I had gained even more strength overnight after seeing a post on Instagram about Tiwonge Chimbalanga, a gay man who was the first to marry in his country of Malawi. The story was rather sad and it did not have a happy ending but Tiwonges strength and courage reminded me that someone has to lead and be the face of change and tolerance specially in tough places. I had to wear my shirt and be truthful to others about it for Tiwonge and many others like him who struggle for acceptance. The cold, early morning of race day had me seeking warmth under a long sleeved shirt and long pants. My Lez Run shirt covered up for the time being. I was desperate to reveal it. Had it not been for the fact that I planned on donating this long sleeve shirt after the race, I would have ripped it off of me as soon as the sun rose and I could feel it’s warmth. The picture below shows the moment I stood proudly in front of the start line. Once everyone lined up, I disappeared into the crowd. We were all runners. Running for our own cause. We were all different yet the same! I felt like I had energy for days! I ran proudly and felt a sense of belonging. All my fears dripped off of me like my sweat. I could not wait to tell others back home that Lez Run had participated in a marathon in Kenya! I thought this is how it’s supposed to be. 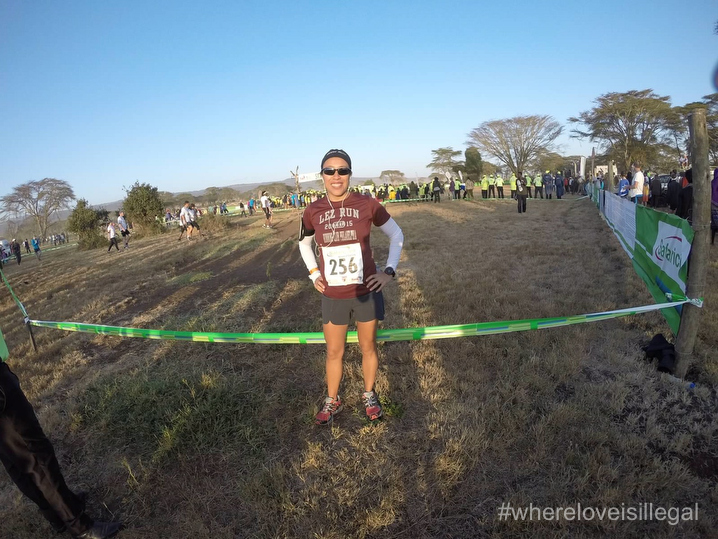 I was a proud lesbian athlete running in Kenya.